The constellation Orion. Roll mouse over to see labels. Orion is the most instantly recognisable of all constellations – the figure of a man represented by the stars Rigel and Betelgeuse, both among the top ten brightest stars in the sky. Straddling the celestial equator, it is visible from almost anywhere on Earth, a prominent feature of the northern winter sky and of the southern summer sky. In total, Orion is home to 10% of the seventy brightest stars, despite covering only 1.4% of the sky. At a distance of around 250 pc (800 lightyears), these stars are not unusually close to the Earth. However, they are very large, luminous stars that shine brightly even from a long distance. Many of these stars were born in the area around the Orion nebula (M42), the most massive star-forming region in the Sun's vicinity. M42 is one of the most brilliant of all deep sky objects, visible to the unaided eye as a smudge below Orion's belt. In addition to the bright nebulosity of the star forming region itself, this area of the sky is also home to numerous bright open clusters. Unsurprisingly for such a bright grouping of stars, Orion is among the most ancient constellations. The Sumerians associated it with the hero Gilgamesh, facing a charging bull represented by the neighboring constellation Taurus. Surprisingly, however, the Greeks did not associate Orion with any of their better known heros, but rather with a lesser known son of the sea god Poseidon. Rather than associating him with Taurus, the Greeks associated him with the two hunting dogs, Canis Major and Canis Minor, said to be in pursuit of the hare Lepus at Orion's feet. 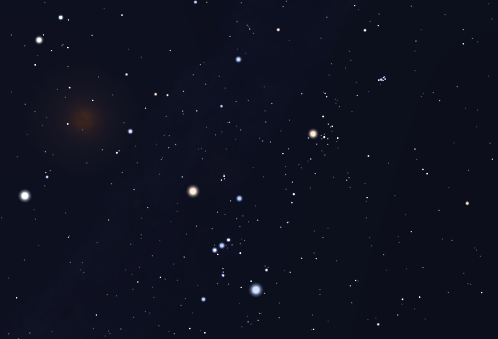 Orion contains the following Messier objects: M42, M43, M78. 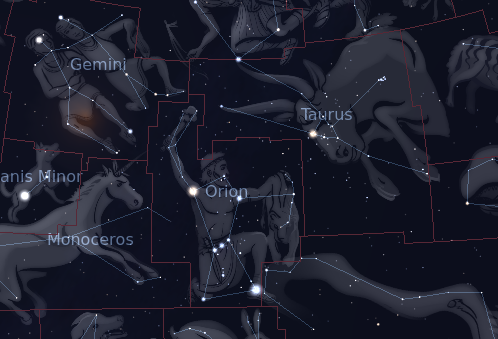 The following constellations neighbor Orion: Eridanus, Gemini, Lepus, Monoceros, Taurus.